James C. Freeman, is a highly experienced civil litigator and is of counsel at the Law Office of Andrew J. Gilbride. 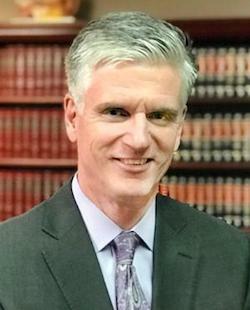 Mr. Freeman brings with him with more than 25 years' experience as an attorney and our office is fortunate to join forces with an accredited and successful litigator who shares not only our work ethic but our commitment to our clients. As a highly experienced civil litigator, Mr. Freeman has recovered millions of dollars on behalf of his clients. His proven track record has earned the attention of various media outlets and he speaks regularly on legal topics and policies. A former Assistant County Attorney with extensive trial experience, Mr. Freeman also has represented both physicians and hospitals. The depth of his experience and knowledge representing both the injured and the insured alike, benefits our current clients, medical malpractice and personal injury plaintiffs. Mr. Freeman is an active member of the local and American Bar Associations, as well as New York State Trial Lawyers Association. The most tenacious, caring, down to earth hometown hero! Not only an attorney, but a compassionate, realistic, FRIEND! He's the only attorney I know who answers his phone, calls to check in on you, and genuinely cares. Consummate professional that has his clients best interests at heart. Tim K.
Andrew is currently working with me, and I have nothing but wonderful things to say about his attentiveness to my situation and circumstances. HIGHLY recommended. Ralph R.
As first time home buyers, my husband and I were very stressed out, especially running into bumps in the road trying to obtain a mortgage within the contract time. Andy put our minds at ease throughout the whole process and was extremely knowledgeable. I have since referred a number of friends and family to Andy for all kinds of matters including residential Home Sales, Divorces and Family Court Matters. They, as us, have all been very pleased with his services. We highly recommend. Melissa and Thomas Q.